In the West Gallery, the Art Guild of Pacifica presents a favorite exhibit called the Buddy Show. Each Art Guild member who participates invites a friend who is not a member to exhibit along with them. In the Buddy Show, the Guild has found a wonderful way to promote Guild membership, and to bring in some new artistic expressions and fresh approaches, as well as to celebrate the importance of friendship. Sanchez Art Center is located at 1220 Linda Mar Boulevard in Pacifica, about a mile east of Highway 1. After opening night, the galleries are open Friday, Saturday, and Sunday, 1–5 pm, and by appointment, through April 3. 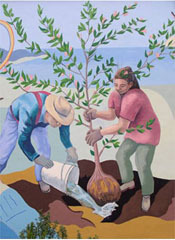 For information about the Art Guild of Pacifica, visit ArtGuildofPacifica.org.